Abstract: Large datasets of mineral species and their associated chemistries, properties, localities, and geologic ages have enabled an unprecedented way to explore Earth’s history. Analyses of these datasets led to the discovery that minerals conform to a Large Number of Rare Event (LNRE) statistical distribution, the same distribution adopted by words in a book. Most mineral species (>50%) occur at only 5 or fewer localities, while only a few mineral species are widespread. The same analysis can be done with subsets of minerals – in particular, we have analyzed the distribution of carbon-bearing minerals and used the results to predict the existence of 145 undiscovered carbon mineral species. We have launched a worldwide search for these minerals called the “Carbon Mineral Challenge” (details discussed during the lunchtime talk). In addition, plotting the coexistence of minerals leads to social network diagrams that reveal new patterns in the distribution of minerals on Earth, and can even be used to develop a statistical foundation for all of petrology. Geologic ages in the database allows the introduction of a time dimension, and shows us how Earth’s mineralogy (and overall chemistry) has changed over time. We find that the formation of new mineral species is highly correlated to periods of supercontinent formation, with conspicuous gaps in the production of minerals during intervening time periods, indicating that plate tectonics played a crucial role in Earth’s mineralogical development. We also see an increase in the oxidation state of redox sensitive transition metals over Earth’s history, especially for minerals of manganese, indicating that mineralogical data can be used to trace the oxygenation of Earth’s surface. Correlating these data sets with corresponding data sets for rocks, fossils, and proteins reveals exciting new details about how the delicate interplay between geological, chemical, and biological processes eventually produced the Earth we see today. 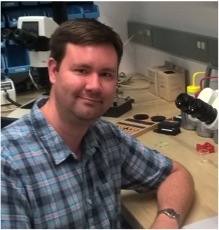 Bio: Daniel Hummer is an Assistant Professor of Geology at Southern Illinois University in Carbondale, IL. He is a mineralogist and geochemist whose research attempts to answer fundamental questions about how minerals crystallize, particularly from aqueous fluids, how different crystal structures result in different phase stabilities, and how Earth’s mineralogy has changed over time. Hummer received B.S. degrees in both Geology and Chemistry from Iowa State University in 2004. He then earned a Ph.D. in Geoscience from Penn State University in 2010, working with Peter Heaney on the aqueous crystallization of titanium oxide minerals. Subsequently, he was a postdoctoral researcher at the Carnegie Institution for Science and UCLA before starting as an Assistant Professor at Southern Illinois University in 2016. Hummer has earned multiple awards for his work in experimental mineralogy, including a fellowship at the Carnegie Institution for Science, and the Kraus Award for Crystallographic Research from the Mineralogical Society of America.